Lynnwood, WA : Emerald Books, c2001. 231 p. : map ; 21 cm. 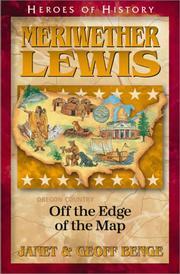 Meriwether Lewis : off the edge of the map / Janet & Geoff Benge. 504 BibliogEtcNote $a Bibliography, etc. note Includes bibliographical references. 520 Summary Etc. $a Summary, etc. note A biography of the co-leader of the 1804-1806 Lewis and Clark expedition into the unmapped American West, including his early life and the formation of the Corps of Discovery. 650 Subj:Topic 1 $a Source other than LC Explorers. $x General subdivision Discovery and exploration.